Photos, New beads & October…?? Hot hot days of summer…. Jelveh, you should be so proud of yourself, you work very hard and do beautiful work and that type of passion should not go unnoticed ever. I emailed all my friends and clients who are etsy fans for just about everything and had to brag that I have some of this famous person's art that they will soon be able to own if they choose. Hey, in this economy any marketing tactics are fair right? Congratulations Jelveh, you're a star! I can't wait to see how your trip transpires into your upcoming work! Peace and love. You are really on a roll! Congrats again. I am not surprised though. You do such beautiful work! 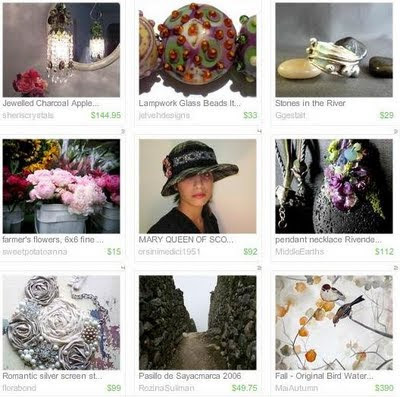 Who would not want your yummy beads in their treasury? WOW, go you! You're getting those treasuries! On to the Front Page!!! Sign up here to receive our VIP updates!